Q. Are rooms still available? Q. How do I make a Room Reservation? Q. What is the difference between Single and Doubles offered by Renaissance Downtown DC? A. Single and Doubles refer to the number of beds in the Room. A Single Room means one bed. A Double refers to a room with two Queen size beds. Please check with Hotel for most accurate listings or rooms and room types. Q. How much is a hotel room? Q. Does the $152 hotel room include anything else? A. No. This only is for the hotel room. Taxes, Parking, Admission to the event, Food and Drink are not included in this price. Q. What type of music will be played in each ballroom? Q. How many ballrooms are included? A. @UTNYE offers 8 ballrooms to choose from for all access passes! Upgrades include Open Bar for 3 hours (10:30pm-1:30am), discounted hotel rooms, upgraded VIP Seating in Main Ballroom and more. See Ticketing for all we have to offer. Q. Where are the ballrooms located? A. @UTNYE has music and dancing in Eight (8) Ballrooms throughout the Hotel in many genres. All ballrooms are located on the Ballroom Level of the Hotel. Grand Ballroom is our Main Ballroom where VIP Table Seating Pass holders will have their tables by ALL THE ACTION including the Main Stage, Live Bands, Crazy Hour after midnight, dance floor, VIP bars and roped off section. The other seven ballrooms are located throughout the hotel! Signage will be provided at the event. Q. Where will workshops be held? A. Workshops will be held in various ballrooms on the Ballroom Level of the Hotel. Signage will be Provided and hotel/event staff will be able guide you to the corresponding room. Be sure to look for the @UTNYE logo. 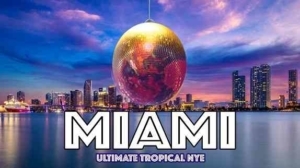 Ultimate Tropical NYE is the biggest Tropical event in DC!